Wouldn’t it be nice if you could see what company you were logged into in Acumatica when you are using the Outlook Add-In? See any history that you’ve had with this particular sender. Mark the sender as a lead, opportunity, or create them as a contact. Add email to a contact, case or opportunity. You can do all of that without leaving Outlook. But if you are working with multiple companies in Acumatica, you need to be sure that you are logged into the correct company before you start searching for and adding data. 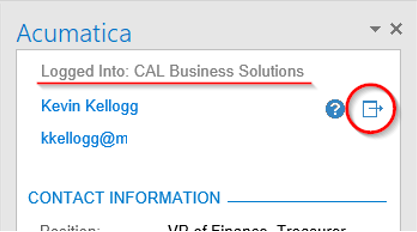 At CAL Business Solutions we use Acumatica as our internal financial management system. Since we also have a team of developers on staff, we can make customizations to our own system. And then offer those to our clients too. One recent customization our developers did to our Acumatica system was to add a company label at the top of the Outlook Add-In that allows you to see the company you are currently logged into. Need to make a change? Clicking the sign out button at the top right corner of the add-in will allows you to log in to a different company. There are always little things that can make an ERP system better. Very often a simple customization can improve your productivity and just make you enjoy using the system even more. If you use Acumatica and want to discuss this customization or other customizations to improve your system, the development team at CAL Business Solutions can help. Contact CAL at 860-485-0910 x4 or sales@calszone.com.